The fourth grade recently did a S.T.E.M. project that was informative, interesting, creative, and lots of fun! As a class, the students read a book called Cookieland by Johnny Gruelle and then designed their own cookie and candy houses. The students designed houses, paths, roads, trees, and ponds with colorful candy. They enjoyed creating their houses and sharing their houses with each other! We have some very creative fourth graders! 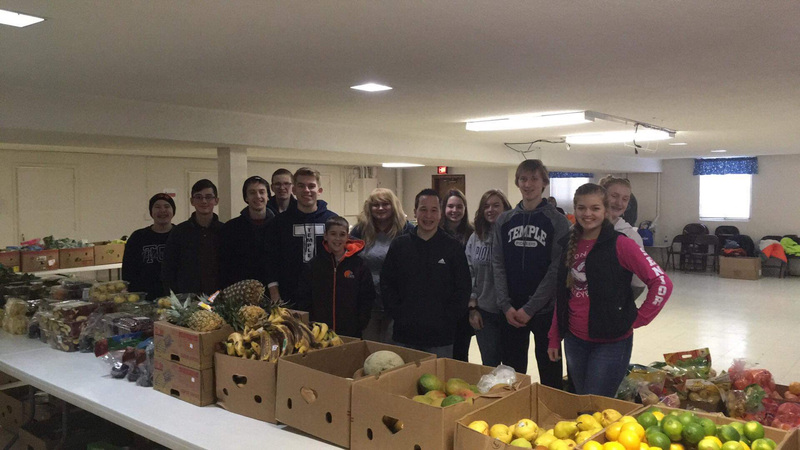 On Thursday, the student government members helped with the distribution of food at the pantry run by St. Mark’s in downtown Lima. The Ohio Food Bank truck arrived, and the students unloaded about ten thousand pounds of food. They categorized the food and set up the distribution tables. Some of our students joined the pastor and other community volunteers in prayer asking for the Lord’s blessing on our interaction with the people that day. It was wonderful to hear our students asking the Lord to help them be an encouragement and example of God’s love. The students kept the tables stocked, carried boxes to cars, and chatted with those that came through the line. Junior Carol Smith said, “I loved doing this today!” and she was such a ray of sunshine with her perky “have a blessed day” as the participants left. The church said Temple was a huge help to them, and they would love us to come back any time. In the fall, the third grade students went to the Johnny Appleseed Farm Park to learn about Ohio in the 1800’s. On Friday, one of the Farm Park’s representatives, Beth Theison, came to Temple to further their learning experience. Students were grouped into families. They simulated a family moving from Urbana to Lima to homestead and build their own cabin. They had to travel by covered wagon pulled by two oxen. A two-hour trip today would take a month then. Because of the Great Black Swamp, families needed to travel in the winter. Students had to shop for their family’s trip. Students had decisions to make as to what happened on the trip. Did their family make it to Lima in time? Through this experience, students realized what it was like to be a pioneer. Valentine’s Day is less than one month away, and the seniors are gearing up for their Honey Gram Fundraiser! They will be raising money for their senior class trip to Washington D.C. in May. Be on the lookout for order forms next Tuesday or Wednesday. They will be selling carnations, plush toys, candy, singing grams, and t-shirts that can be worn on Witness Wear days throughout the remainder of the school year! Rumor has it, that an unnamed superintendent will wear (in his words) “the corny” Olive You t-shirt on Valentine’s Day if we sell 50 of them. Of course, we have another t-shirt design also available if you are not interested in this design. We can’t wait until next week to show you what items you can buy to help say “Happy Valentine’s Day” to someone you care about! Renewals for Edchoice Scholarships begin on February 1st. Renewal applications have not yet been released by the Ohio Department of Education, but they should be available soon. Please see Amy Link in the Elementary Office for information about renewing your Edchoice Scholarship. All youth boys/girls basketball games and junior high games are cancelled Saturday due to incoming weather. Fri. Jan. 18 Varsity/JV Boys Basketball at Riverside @ 6:00 P.M. Sat. Jan. 19 HS Bowling Match at Home (20th Century Lanes) vs. Shawnee @ 3:30 P.M. Sat. Jan. 19 Varsity/JV Boys Basketball at Miller City @ 6:00 P.M.
Mon. Jan. 21 Pioneer Classic High School Bowling Tournament at Westgate @ 10:00 A.M.
Tues. Jan. 22 Varsity/JV Boys Basketball at Home vs. Calvary Christian @6:00 P.M.
Tues. Jan. 22 JH Boys/Girls Basketball at Home vs. Calvary Christian @ 4:00/5:00 P.M.
Thurs. Jan. 24 JH Boys/Girls Basketball at Home vs. USV @ 5:00/6:00 P.M.
Jan. 24 Early Release for Faculty Development 1:00 P.M.